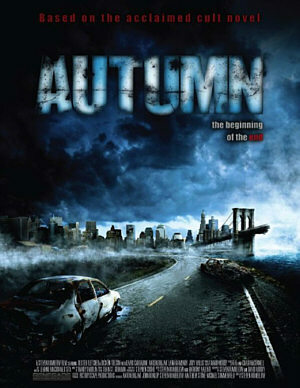 If you like dark, weird, and out-of-the ordinary zombie films, here is one named Autumn. The story takes place during the fall season and there is an out break of a deadly virus that kills and spreads very quickly. The people that do survive from this outbreak gather in a church and wait for the unknown. The next day the survivors wake up to a surprise that all the dead people are walking again, so some of them decide to split up. The three main characters of this film find a farm house to seek shelter. There is only one problem; the dead are getting stronger and more aggressive each day that they are walking. David Carradine has a small part in this movie. He plays a guy who is kind of confused about all of these dead people walking around and he keeps his zombie mother locked in a room. Some scenes in this movie are a little disturbing and gross. Before the zombies attack, the film goes in slow motion. Then when the zombies are eating, the film goes into fast motion. But I think it is a good zombie movie to watch and I have the DVD. Comments for Autumn – Movie Trailer and Poster are now closed.